In the previous two Parallelograms we looked at discoveries made by D.R. Kaprekar, an Indian mathematics teacher who was born in 1905. By the way, if you missed them, go back and complete Parallelograms 1 and 2, as it is never too late to pick up reward points and start earning badges. This week, we’re going to look at something called a Kaprekar number, which Wikipedia defines as: a positive integer with the property that if it is squared, then its representation can be partitioned [or split] into two positive integer parts whose sum is equal to the original number (e.g. 45, since 452 = 2025, and 20 + 25 = 45. Another example is 9, because 92= 81, and 8 + 1 = 9. 1.1. There is a Kaprekar number between 700 and 710. Which number is it? 703, because 7032 = 494,209, and 494 + 209 = 703. When you square each of these numbers, you can then partition or split the result into two half-numbers, and then you can add the two half-numbers to rebuild the original number. When you do this, the value of the smaller half-number is always…. 1 - For example, 9092= 998,001, and 998 + 001 = 999. Usually, if two systems start off in ALMOST the same way, then a while later they will evolve into two systems that are still quite similar to each other. If one 5-year-old child is 1 mm taller than another 5-year-old child, then ten years later that 15-year old child might be, say, 1 cm or few centimetres taller than the other one. In contrast, in a chaotic system, ten years later one child has grown taller, while the other child has shrunk to the size of a grain of rice. That is not a technical definition of mathematical chaos, but it might give you some idea of what it means. This video shows a double pendulum exhibiting chaos. If you had two identical double-pendulums starting in microscopically different positions, then a minute later they would be in wildly different positions. Watch it, and then answer a question about the video. 2.1. What sort of light is generated by Devin’s LED? As I mentioned last week, if you are a Year 8 student, then it is likely that you will be taking part in the United Kingdom Maths Trust (UKMT) competition known as the Junior Maths Challenge (JMC). If you do particularly well, you might earn yourself a gold, silver or bronze certificate, but you will have to work hard as you will be competing against students from across the country. 3.1 Two numbers in the 4 × 4 grid can be swapped to create a Magic Square (in which all rows, all columns and both main diagonals add to the same total). Start by sketching the initial magic square. Next add up all the rows, columns and diagonals, and you will notice that most of them sum to 34. If you are going create a magic square by just swapping two numbers, then it is probably going to be easier to make everything add up to 34, rather than making all the 34s add up to something else. Start by sketching the initial magic square. Next add up all the rows, columns and diagonals, you will notice that most of them sum to 34. 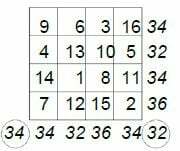 If you are going create a magic square by just swapping two numbers, then it makes sense to force everything else to add up to 34. If a row, column or diagonal already sums to 34, then you probably don’t need to adjust anything, so cross out all the numbers in those columns, rows and diagonal. The numbers that you need to swap will be among whatever numbers are left. One of the remaining numbers is the 13 on the diagonal that goes from top left to bottom right, which totals to only 32. So this will need to be swapped with the 15 on the bottom row. As well as correcting the faulty diagonal, this swap also fixes the other problematic rows and columns. So, the two swapped numbers are 13 + 15 = 28, which means the answer is 28.